I have always been word-crazy, and I have never hesitated to try my hand at a word game. 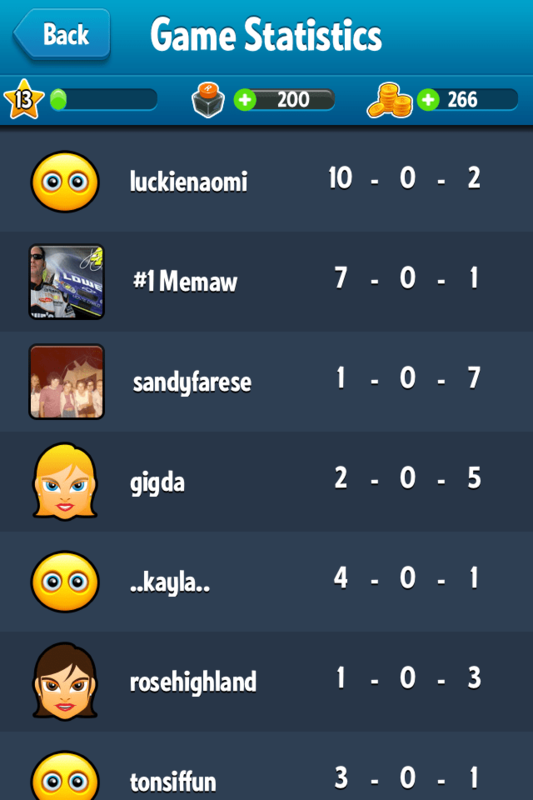 In Ruzzle, I found myself up against a formidable wall and HEY! I’ve found a blog post topic too. While it is true that a Ruzzle game only takes two minutes, this has turned out to be the Lay’s Potato Chip “you can’t eat just one” equivalent of my online life. Also, I hate losing! By way of introduction, Ruzzle calls itself “the world’s fastest word game.” The premise is simple: players swipe through the 16 letters on the board, trying to accumulate as many words as possible. Each match is a series of three two-minute games. Want tips on how to improve? There’s a strategy guide for that. 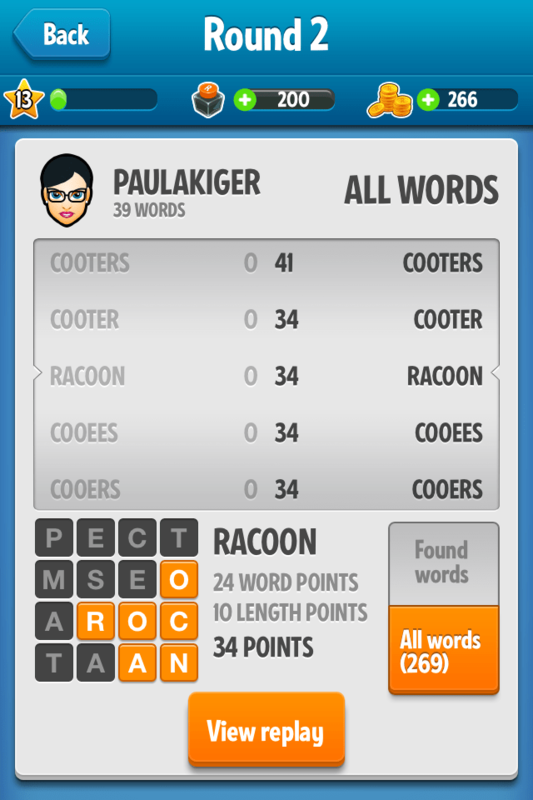 Desire to “get good at Ruzzle”? Visit this blog. Need tips and tricks? Visit this site. 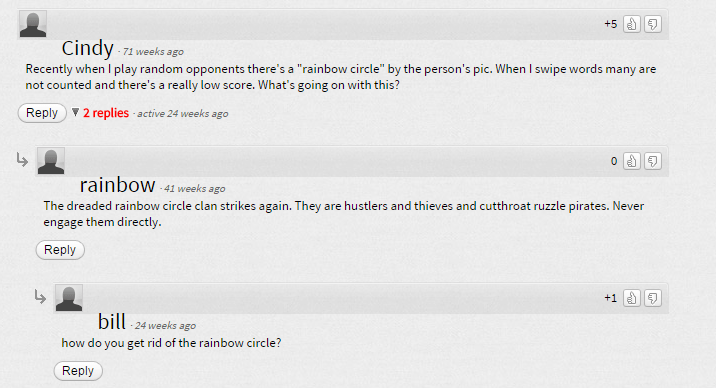 And, apparently avoid the “dreaded rainbow circle clan” of Ruzzle pirates (?). This is where the parallel to real life and much of the feedback I have always been given really hits home. When I look at the “possible words” vs the “found words” after a game, I see so many missed opportunities, mostly the ones that involved following a line of letters through a relatively byzantine path. It reminds me of professional situations where I literally was going down a string of 200 emails, one by one, and not categorizing or prioritizing. It happened recently when a coworker had moved something I needed to do under my page on Basecamp, and I asked about it publicly in our staff FB page, before realizing it was there, if I had searched differently. Strategy: it pays off. Eventually. Let’s hope. When I first started playing Ruzzle, I would be mortified at a low accuracy percentage. I have learned that in Ruzzle (but not life in general! ), there are more important qualities than accuracy, such as furiously (and intelligently) swiping at combinations you *think* may be words, and latching on to a multi-purpose endings such as “ing” and trying every combo out there, even the ones that aren’t really words. As someone who proofreads on the side, this de-emphasis on accuracy is a lesson wrapped within a challenge. There are many apps for which I don’t find it worth paying the buck or two extra for the premium version. I’ll look at the five-second ads, deal with a few limitations. 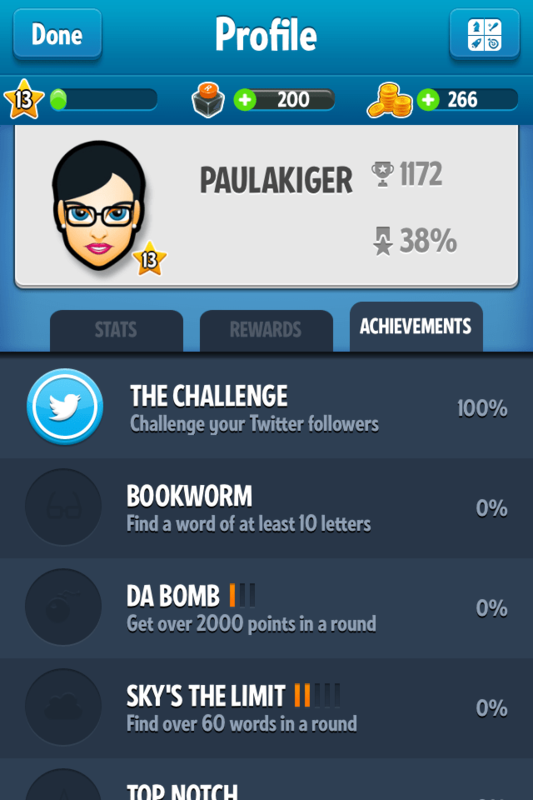 But the perks for Premium Ruzzle are pretty cool, especially if you are obsessed with improving. With Ruzzle, paying the $2.99 for premium gets you unlimited ongoing games, statistics, and the possibility to see all words on the board after a finished round (that’s my favorite part!). Yes, I am embarrassed that I am a North Florida born and bred woman and missed “cooter” (the turtle …everyone else needs to think clean). Ruzzle has “achievements” you can unlock. Well, being the goal-driven person I am (see topic #1 about the two-minute issue), I want to Achieve ALL the Achievements!!!!!!!! The thing is, you can say to yourself “I am going to achieve the ‘Speedster’ badge this game” but you can’t make yourself find 30 words in 30 seconds or (the one I really want) “find a word of at least 10 letters” (the Bookworm badge). At least I am 100% on “Challenge your Twitter followers”! The elusive bookworm badge. Sigh. I have played Ruzzle in Spanish a few times. I can see why this might be helpful to my Spanish learning efforts. Unfortunately, I left the setting on “Spanish” when I started to play a tournament once and that resulted, understandingly, in a major Ruzzle fail! Every time I sit there staring at the Ruzzle screen, realizing it expects me to “tap” for the next step (even though it does not TELL me to “tap” for the next step), I am reminded that the app / digital world expects me to know what to do. Maybe my children have some intuitive “tap to make the next thing on the screen happen” reflex, but I still expect directions. That’s probably not going to happen, is it? Why am I attached to Ruzzle? I would say 1) words! 2) connecting with people, especially the first friend who asked, and 3) the thrill of competition.